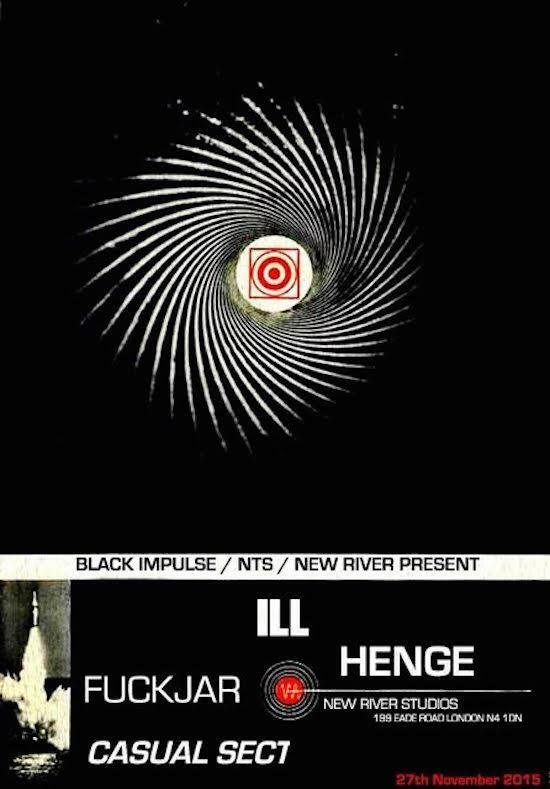 The team behind NTS radio show Black Impulse is teaming up with New River Studios to host a night of hard-hitting music featuring a number of live bands and DJs thrown in for good measure. Manchester punks ILL headline having been booked off the back of a stellar showing at Supernormal 2015 earlier this year while Henge will provide a healthy dose of doom and sludge-ridden metal following the recent release of their debut album through the God Unknown label. Fuckjar simply come with the following explanation from the organisers: “We saw them one. Our hearing has never been the same.” Finally, Casual Sect complete the live bill with more gnarly punk fresh off the release of a new record and cassette on BOX Records. DJ support on the night comes from Into the Void and a selection of NTS DJs with Black Impulse’s Heather, Hung, Drawn, Quartered’s Fergus McDonald and Perfect Sound Forever’s Padraigh Perkins-Edge all playing music. It all takes place at North London’s New River Studios on November 27 with bands starting at 8pm. You can find more details here.